Meet the best digital assistant for schools! PTConnect gives you a one-stop solution for managing your school effectively, by bridging the gap between teachers, parents, and students, thus providing seamless communication via use of digital technologies. We apply innovative, efficient and easy to use technology in creating an interactive and informative environment for schools; overall, a perfect solution for parents, teachers, students and the entire school. No need of logging into your parent portal every time to check if you have received any update. 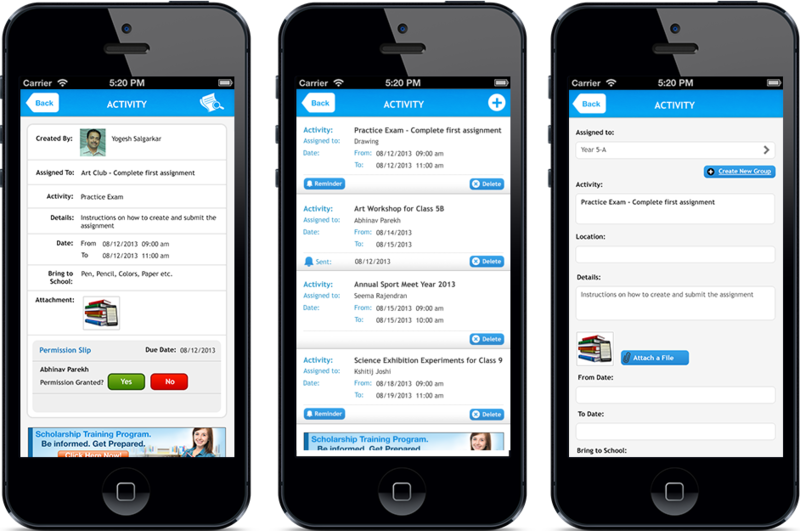 Educodesk provides you real-time updates on your smartphone. Educodesk gives you an easy-to-use communication platform with the school, thus keeping you involved with the school’s activities all the time. 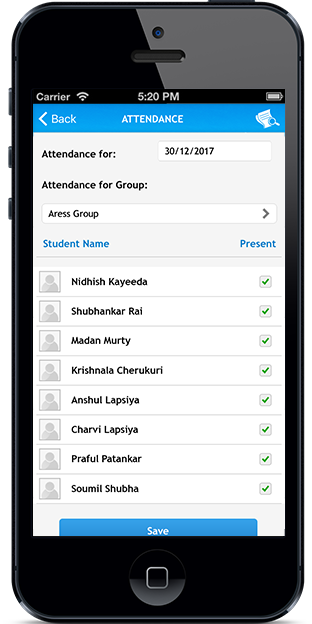 You can now keep a track of your child’s attendance at school, and get updated in case he misses out on any lecture or is unable to reach on time. Educodesk helps you get a detailed performance report of your child’s overall activities at school, that too without going and fetching it from the teacher. Never miss out any important activities and events for the day, you would get to know about it way before your child informs you! Planning a holiday next month? The entire year’s academic calendar is available on your smartphone. Check with the days suitable for you, and you’re free to book your tickets! Parents can view & sign off the permission slips issued by the school, on their smartphone. Even daily homework & classwork assignments can be viewed on the app. Worried about your child reaching home safely? Get an all GPS-based mapping of the school bus with details of the route and timings. All the data with regards to your child is completely safe and secure. No other user would be able to access your child’s information unless you permit them. How about getting a branded app for your school? Of course, it will give your school the much-needed value addition, also it’s easier for the parents to connect with it. No more phone calls or personal meetings with parents, Educodesk helps you have an organized & issue-related communication platform, thus saving your time! A class teacher can create groups based on any event or activity held at school; she can also invite other teachers and students to the same and share relevant information. Educodesk provides you a permanent solution for analyzing students’ performance over the years, thus providing you the right information effortlessly! Ever thought of going green? Educodesk helps the school go paperless and avoid the use of traditional grade sheets and other documents. No more compiling huge stacks of files in the school office, extracting any random data at any point of time becomes easier when you have an effective database management solution. As a principal, you now have an access to the entire school’s detailed information on your PC or laptop, easy to understand and fetch. There is cost and time involved with the amount of paperwork you use. Educodesk helps you reduce your overall expenses on endless printouts and Xerox copies. Educodesk helps you have a quick interaction with a number of parents at once, thus making the overall process much efficient, saving time for you to focus on other important things. Groups:Forming the backbone of the system. Teachers can create and form groups for every class & division, which can include other teachers and students as well. Class teachers can create separate groups for their class as well as for various activities. For example, Art workshop group, Reading group etc. and then invite appropriate students to join these groups. This allows them to share the information specific to that group only. Student groups can be created from different classes who are participating in the same activity. For example, After-school clubs. Groups can be formed between teachers and parents as well, in regards to a particular topic or an important notice to be issued. Homework:Ensuring that the homework is informed about and completed on time. 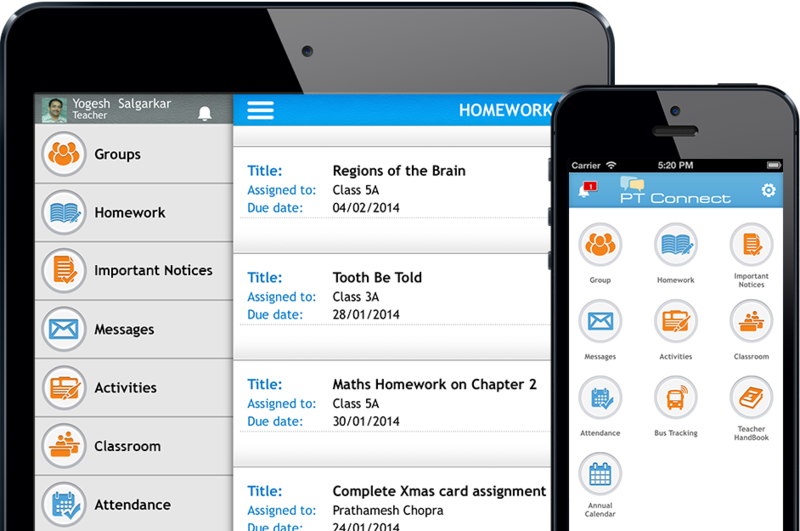 Homework management is one of the core functionalities of the system. 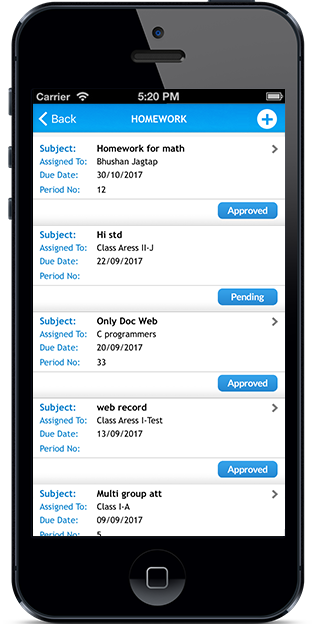 PT Connect provides parents with an easy access on their mobiles to information on what homework has been assigned to their children and when it is due. Teachers, in turn, can upload and edit information about homework assignments or even send attachments. Homework/assignment notifications come with due dates and reminders and can be sent to all parents in a class, parents of groups within that class, or even individuals. Permission Slip and Notices:Helping teachers and administrators maximize their day by minimizing repetitious reminders to parents. Important messages can be sent to individuals or groups of parents. Parents can be required to indicate by return whether specific calls-to-action e.g. sending a signed permission slip via their child, have been at their side. Others, such as individual messages, can be responded to by the parent directly from their mobile. Teachers can determine if a response is either required or allowed. Where formal responses are indicated as being necessary, parents are given reminders on their mobiles until they respond directly or confirm through the application that the required action has been taken. Teachers and administrators can check at a glance how many responses are outstanding and who they are yet to come from. Messages:A platform for timely one-to-one and one-to-many messaging. 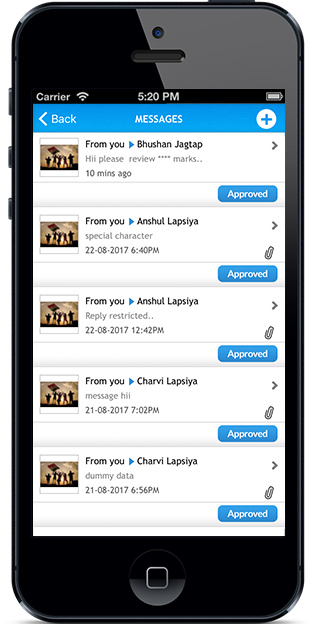 Teachers and administrators can send messages about any subject to each other or to parents, either as an individual or as group messages. If permitted by the originator of the message, the recipient can respond directly to the sent message. The message originator can also close the message dialogue at any time. For example, when the required responses have been received. Activities:A tool for parents to keep on top of all the paraphernalia needed for curricular and extra-curricular activities. Parents can see the activities their children are involved in at school. As with homework, activities can be associated with all the students in a class, a year or even the whole school, as well as individual students. Even teachers can be associated with the activities. This function is particularly useful because it allows parents to see what their children need to bring with them to school for the activity and to prepare accordingly. Attendance:Facilitating the sharing between schools and parents of information about individual child absences. Parents receive a push notification on their mobiles if their child is absent from school or for any activity. Then can also inform schools, either on the day or in advance, if their child would not be attending on a given day. It’s easier for the schools as well, as it saves a lot of time for them, plus keeping a record and extracting any attendance report subject to any date becomes easier and faster. 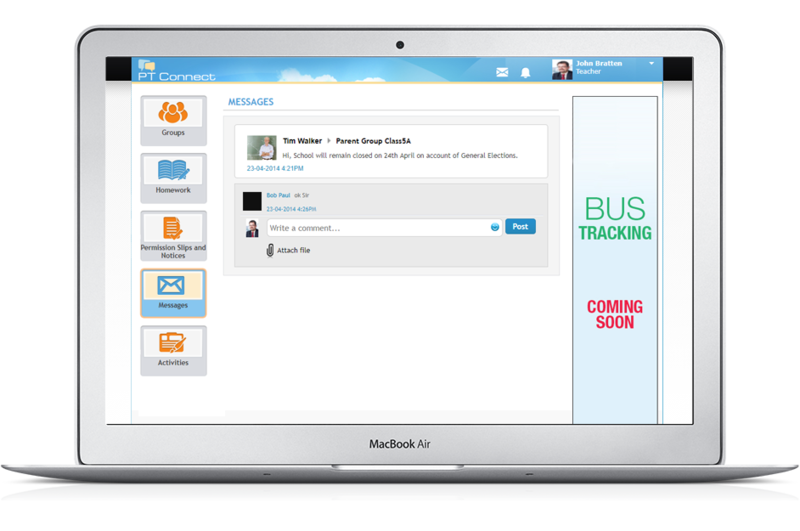 Bus TrackingReal-time location of the school bus, putting parents to an ease. With the assistance of real-time GPS (provided the school buses are equipped with GPS tracking devices), parents can keep a track of the school bus’s route and time required by it to reach the appropriate location. 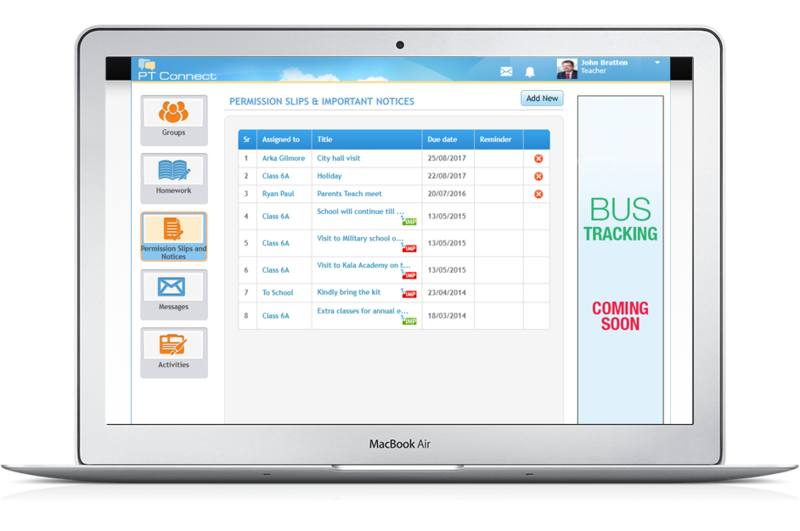 Once the child has been assigned a specific bus, the parent is notified on their device and the feature gets activated. 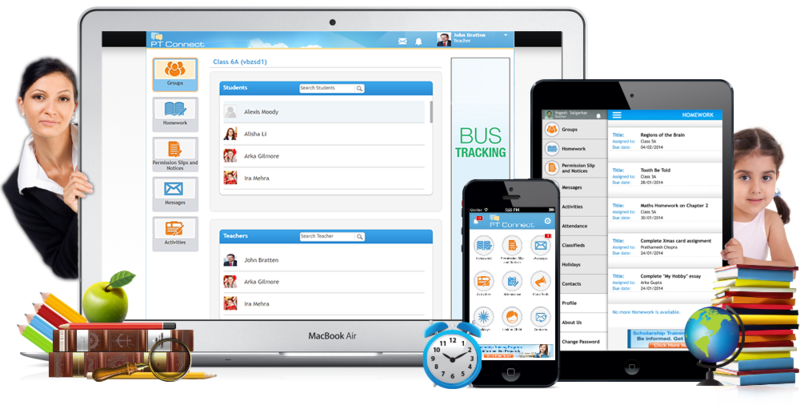 Therefore, they can use this feature to keep track of the bus in which their child is traveling. Parents are well informed in advance in case of the unavailability of the school bus at any point of time, thus avoiding the end moment worry and hassle. Classroom:Never miss out any lecture, get updated on the day’s class work on your mobile. In case the child is unable to attend the school for a few days, it becomes difficult for the parents to get the respective notes once he/she is back, and a lot of time is spent on getting on the same page as the other students. 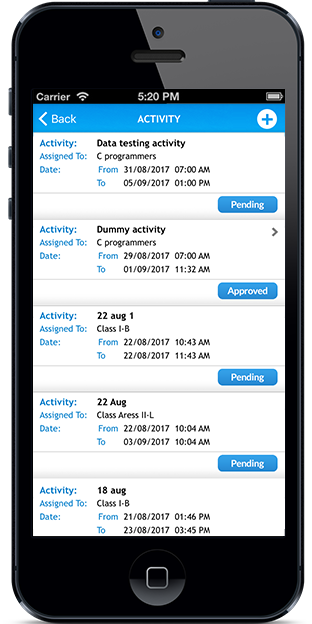 With PT Connect, the classwork notes are sent to the parents’ mobile app on a daily basis, in case he/she was absent for the day. Schools benefit a lot from this, as the teachers no longer would have to face the issue of teaching the same topic to the student/s who were absent for that previously. Annual Calendar:The whole year’s academic and extracurricular calendar is there on your mobile. 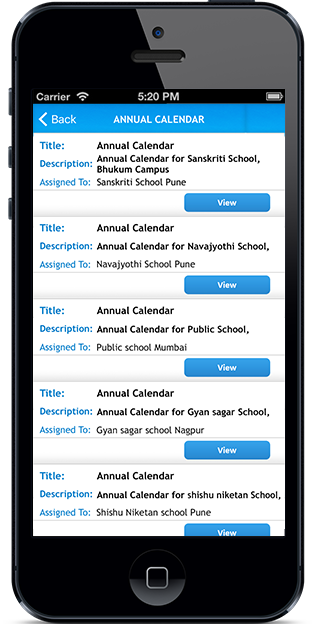 The parents get the whole year’s academic calendar on their mobile app, including details of the various events and functions that would be organized in the school for the said academic year. Parents receive all updates regarding the events via push notifications, may it be the Semester test, Annual day, Sports day or the Annual school holidays. Schools can now upload the whole year’s academic calendar on the PT Connect portal, which saves a lot of time and cost for them, and helps the school to Go Green. We very well understand the data security concerns of our clients; thus, we focus on delivering process-oriented, standards-based and quality-driven services. We are an ISO 9001:2008 (Quality Management System certified) and ISO 27001:2013 (Information Security Management System certified) organization which depicts our strong and professional line of action and standardized methods of operations. Designed for all types of educational institutes, from primary schools to colleges. School information when you need it, where you need it. 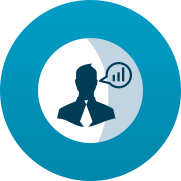 PT Connect is an easy-to-use direct communications channel as well as an information management tool designed to help parents and teachers work together seamlessly. PT Connect is available for below devices. 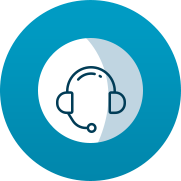 As your digital solutions partner, we understand that handling and maintenance of any software application require constant surveillance. Thus, we offer full-fledged support and organized online training sessions to the schools to get the application up and running. Needless to say, we are there to provide support services in case of any technical issues related to the operations and performance of the overall system, making sure that you are always linked to the students and their parents! 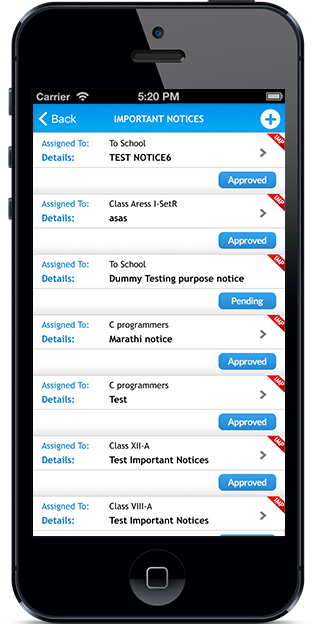 PTConnect is a mobile / web-based communication and management product designed by Aress Software and Education Technologies Pvt. Ltd., which has its offices based in US and UK, with its headquarters in India. We’re a 17-year-old, 500+ employee organization, providing services like Web and Mobile application development, customized Software development and Salesforce development & consultation. We also provide 24/7 technical support for web hosting and software application services. For more details, please check https://www.aress.com. © 2017 PT Connect All Rights Reserved. Welcome to the Educodesk, (http://www.educodesk.com/). This website is best viewed using a contemporary browser. This website is for informational purposes only and is not intended to provide specific commercial, financial, investment, accounting, tax, or legal advice. It is provided to you solely for your own personal, non-commercial use and not for purposes of resale, distribution, public display or performance, or any other uses by you in any form or manner whatsoever. Unless otherwise indicated on this website, you may display, download, archive, and print a single copy of any information on this website, or otherwise distributed from http://www.educodesk.com/, for such personal, non-commercial use, provided it is done pursuant to the User Conduct and Obligations set forth herein. http://www.educodesk.com/ has used its best commercial efforts to obtain the most accurate and timely information available, including information pertaining to currency rates, all of which are complex and subject to rapid change. Accordingly, we do not guarantee the accuracy, timeliness, reliability or completeness of any of the information contained on, downloaded or accessed from this website. The performance of this website and all information contained on, downloaded or accessed from this website are provided to you on an "as is" basis, without warranties of any kind whatsoever, including any implied warranties or warranties of merchantability, fitness for a particular purpose or non-infringement of the rights of third parties. http://www.educodesk.com/ shall be not responsible for any problems or technical malfunction of any telephone network or lines, computer on-line systems, servers, Internet access providers, computer equipment, software, or any combination thereof including any injury or damage to your or any other person's computer as a result of using this website. http://www.educodesk.com/ reserves the right, at its sole discretion, to modify, disable access to or discontinue, temporarily or permanently, any part or all of this website or any information contained thereon without liability or notice to you. As a visitor to our website, you acknowledge and agree that any reliance on or use by you of any information available on this website shall be entirely at your own risk. In no event shall http://www.educodesk.com/ nor any of its data providers be liable for any direct, indirect, consequential or exemplary damages arising from the use or the performance of this website, even if http://www.educodesk.com/ or such provider has been advised of the possibility of such damages. As you browse the Internet, a trail of electronic information is left at each Web Site you visit. This information, which is sometimes called "clickstream" data, can be collected and stored by a Web Site's server. Clickstream data can tell us the type of computer and browsing software you use, the address of the Web Site from which you linked to the http://www.educodesk.com/ Site, and in some instances, your e-mail address. We may use clickstream data to determine how much time visitors spend on each page of our Site and how they navigate throughout the Site. We will only use this information to improve the http://www.educodesk.com/ Site. We use personal information provided by Interested Parties to notify Interested Parties about opportunities, properties, deliver http://www.educodesk.com/ newsletters and otherwise communicate with Interested Parties about http://www.educodesk.com/ and its properties and services. http://www.educodesk.com/ will not share any personal information of its Interested Parties with any unaffiliated third parties, without your consent. Our Site may contain links to other sites. Other sites may also reference or link to our Site. http://www.educodesk.com/ is not responsible for the privacy practices or the content of such other sites. We take seriously the security for all personal and non-personal information associated with our visitors and participants by using secure communications for all such data. However, due to the open communication nature of the Internet, we cannot guarantee that communications between you and http://www.educodesk.com/, will be free from unauthorized access by third parties. If we ever send you information by e-mail concerning http://www.educodesk.com/ products or services, we will provide you with an e-mail address by which you may request no future notices.